"linden." YourDictionary, n.d. Web. 14 April 2019. <https://www.yourdictionary.com/LINDEN>. Any of various deciduous shade trees of the genus Tilia of the mallow family, having heart-shaped leaves and clusters of yellowish fragrant flowers that hang from a leaflike bract. Also called basswood . Also called lime 2. 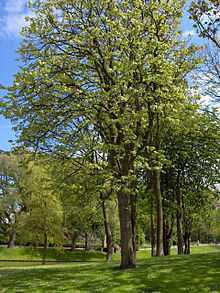 Any of various deciduous trees of the genus Tilia, having heart-shaped leaves. The soft wood of such trees. From Old English linden, lind; from Proto-Germanic *lindijō. The English noun developed from the adjective. Broad with four rows of linden trees). Close by, on the left bank of the Leine, lies the manufacturing town of Linden, which, though practically forming one town with Hanover, is treated under a separate heading. South of Unter den Linden lies the Friedrichstadt, with its parallel lines of straight streets, including the Behren-strasse - (the seat of finance) - the Wilhelmstrasse, with the palace of the imperial chancellor, the British embassy, and many government offices - the official quarter of the capital - and the busy Leipziger-strasse, running from the Potsdamer-platz to the DOnhoff-platz. Among the public monuments comes first, in excellence, Rauch's celebrated statue of Frederick the Great, which stands in tinter den Linden opposite the palace of the emperor William I.; and in size the monument to the emperor William I.